What do you need for winter? Mittens of course! Well you do if you live in Bradford - its cold up north! 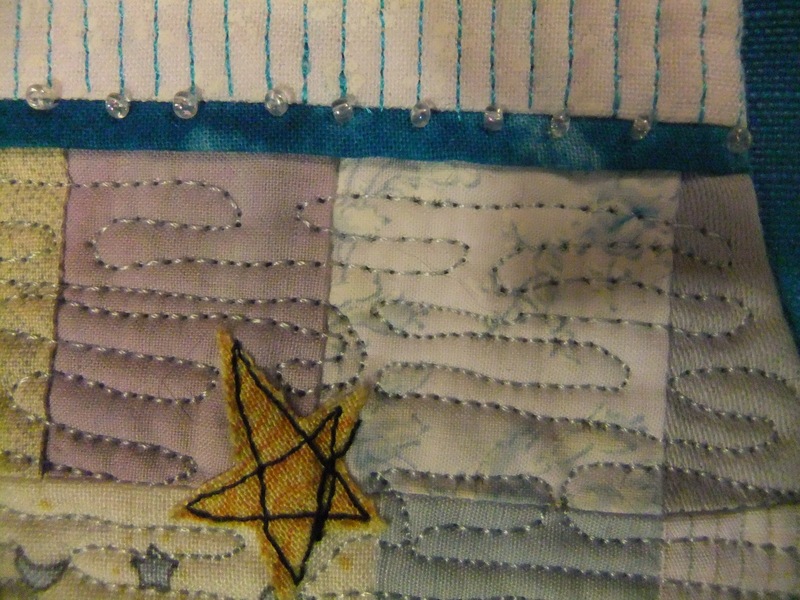 I started going to Calder Quilters last month (after seeing their marvellous exhibition at Bankfield Museum. They were reminding everyone to bring their completed challenge quilts for the next meeting and I asked if she could tell new members what it was - and she said we wouldn't have much time to make anything - well red rags and bulls spring to mind here.... 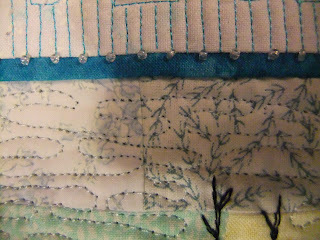 The theme was winter and you had to put lace and beads on.... and it had to be smaller than some measurement that I forgot, but mine is very small! 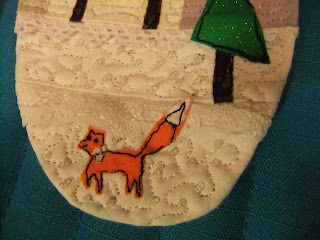 Oh well I had lots and lots of fun making it and I think it will look very cute hanging on my wall! 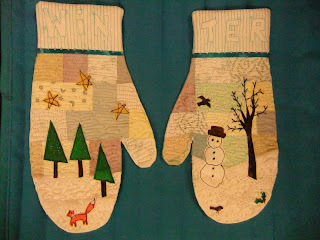 So here is my quilt - in two parts - Mittens for Winter. I drew around my hands for a size guide. The foxy is the only thing I copied from a book - but he is lots smaller than the pattern in the book! 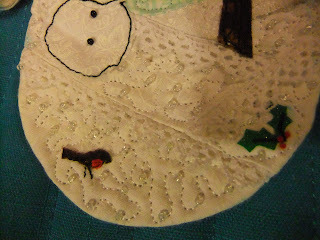 Close up of robin (with embroidered red breast) and holly (with french knots for berries). And tiny size 15 seed beads to make the snow sparkle. 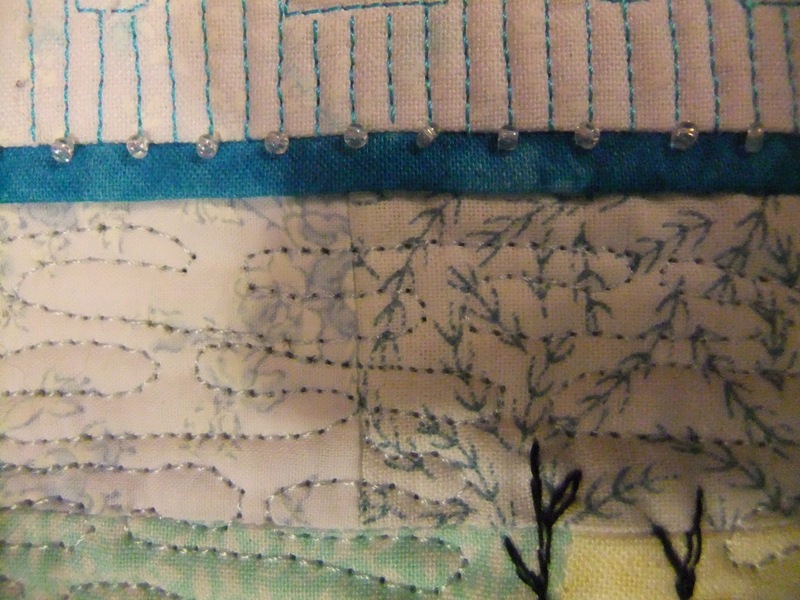 A close up of the beads at the top of the cuff and the machine quilting for the sky. A tiny star in the sky.